Lowrie Sargent, vice chairman of the Camden Planning Board, listens to the presentation Thursday evening on a proposed high-end residential alcohol rehabilitation center. CAMDEN, Maine — The proposed zone change to allow a high-end residential alcohol treatment center to locate in town will not be on the November ballot. 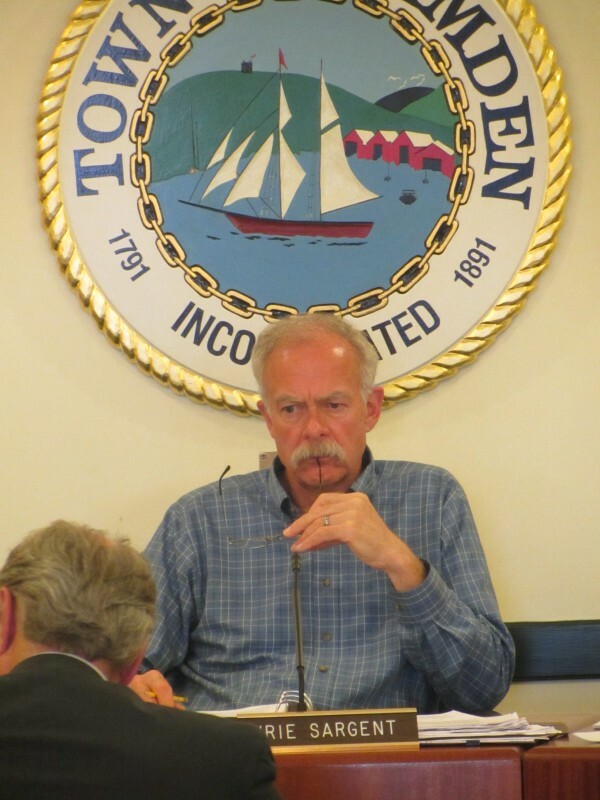 Camden Planning Board Vice Chairman Lowrie Sargent said Thursday evening that the application for the zone change — filed last week by Fox Hill Real Estate LLC — was too late to allow the necessary public hearings by planners and the Select Board to get on the ballot by then. The matter could make the June ballot or be presented for a vote earlier if the applicant makes a request to the Select Board for a special town meeting. About 40 people turned out Thursday evening for the formal presentation by Tom Rodman, who came up with the idea and is an investor in Fox Hill Real Estate. Rodman said the 12-bed rehabilitation center would be a discreet clinic. The open space and buildings on the property at 235 Bay View St. would be preserved for generations, he said. The center would have no greater impact on the residential neighborhood than occurs now, Rodman maintained. The project would be subject to property taxes and give a boost to the local economy by creating 23 to 27 high-caliber jobs, Rodman said. But an attorney representing two neighbors to the Bay View Street property — Leonard and Madlyn Abramsom — submitted a strongly worded letter to the planning board in opposition to the proposed zone change. “We have grave concerns about the appropriateness of the proposed location for an influx of numerous wealthy and famous, and sometimes infamous, people who have no prior connection to Camden,” the letter from attorney Matthew Manahan of Portland stated. A rehabilitation center for the wealthy would attract the news media and disrupt the quiet nature of the residential neighborhood, the attorney stated. “It is our experience that the news media, when motivated by the desire to slur or harass celebrities and other wealthy individuals, will stop at nothing to obtain a story, and they are not afraid to assert their right to report it, even if it involves loitering, trespassing, intrusion, and other public disturbances,” he stated. Fox Hill representatives said at Thursday’s meeting that the typical patients would range in age from their 30s to 50s. They would be voluntary patients and would not have a history of drug trafficking. In February, the proponents of the clinic also indicated that patients would pay $50,000 to $60,000 for a month’s stay. The proposal submitted to the town this week calls for a 12-bed residential facility that would be operated by Massachusetts-based MacLean Hospital, the largest psychiatric affiliate of Harvard Medical School. Fox Hill representatives said they never have had a problem with the media intruding on patients’ privacy at MacLean’s rehabilitation hospital in Belmont, Mass. Attorney Paul Gibbons, who represents Fox Hill, said the impact would be less than what has occurred in the past when there have been corporate events and parties at the property. Michael Thompson, who was the groundskeeper for the previous owner of the property, said he is pleased with the restoration being done by Rodman. Paul Kimberlyn said he greatly supports the project. He said residential treatment centers are needed. Kimberlyn said he hopes the debate will focus on zoning and not turn into a “not in my backyard” debate. He cited a comment by Manahan, who questioned whether the zoning change could open the door to methadone clinics, saying that type of comment concerns him. Harold Amsel, a physician, said his experience shows that 30-day treatment centers are very successful. The Fox Hill proposal was filed nearly five months after being declared dead. The initial proposal was dropped in early March after H. Thompson Rodman announced he could not reach a deal to purchase the property. He had sought a purchase-and-sale agreement with the former owner with a condition that the sale be contingent on town approval for the clinic. Since last appearing before the planning board, Gibbons said his clients purchased the property and now have standing to make the request for a zoning change. Fox Hill Real Estate purchased the property on May 31 from Fox Hill Investments LLC and its principle, Ellen Simmons, according to a filing in the Knox County Registry of Deeds. No sale price has been disclosed, but the town has the property assessed at $6.5 million. The Fox Hill complex includes a main house that is 16,000 square feet on 14 acres. The proposed zone change attracted numerous residents at a meeting in February, with some offering support and others voicing concerns over spot zoning and the impact on the residential neighborhood.